POSTECH would like to solicit creative and innovative research ideas about ‘Health care in future car’ as below. 1. Objective - Seek for blue skies research idea (*) which has unexpected possibility and high impact. 1-page proposal will be screened before supporting seed money to finally foster intellectual property or High-risk/High-impact research proposal for the government/companies. 2. Outline Division Details Note Topic Creative and innovative research idea for the ’Health care in future car’ Eligibility Full-time POSTECH members .. Faculty Position at the Department of Mechanical Engineering, POST.. Faculty Positionat theDepartment of Mechanical Engineering, POSTECH The Department of Mechanical Engineering at Pohang University of Science and Technology (POSTECH) invites applications for an open-rank tenure-track faculty position in all fields of mechanical engineering including robotics, and mechanics/materials. The successful candidate is expected to teach and guide undergraduate/graduate students, develop and perform funded research programs in their major areas. An earned doctorate is required. Candidates must possess either Korean citizenship or eligibility to obtain visa for extende..
Thesis Submission Information (For August 2015 Advanced Degree Can..
Thesis Submission Information(For August 2015 Advanced Degree Candidates)Graduate students who are scheduled to graduate in August 2015 are advised to submit their theses according to the following guidelines.1. Submission period : June 29, 2015 ~ July 10, 20152. Required documents to be submitted A. Hardbound copies of your thesis : 4 copies [Reason] The Thesis deposit policy of the National library of Korea is changed: The Graduate (Master Degree) student should submit 4 copies instead of 2 copies. B. License agreement (which may be printed out after online registration is completed ..
Prevention and Control of MERS (Middle East Respiratory Syndrome) ..
Prevention and Control of MERS (Middle East Respiratory Syndrome) 2-1 versionSince the diagnosis of Korea's first MERS patient, the number of MERS patients has increased rapidly, causing concern among POSTECH members. Accordingly, POSTECH Health Center hereby announces guidelines for preventing and controlling the spread of MERS abided by the policy of the Ministry of Education. For those of you who have symptoms of the MERS virus, please immediately report it to either POSTECH Health Center or Pohang Namgu Health Center in order to prevent spread of the disease. Please carefully read the foll.. Customized Admissions Counseling for Prospective Applicants to th.. Customized Admissions Counseling forProspective Applicants to the Graduate School of Engineering MastershipEstablished to train and foster global engineering professionals, the Graduate School of Engineering Mastership (GEM) is the first graduate program in Korea that provides world-class engineering education. 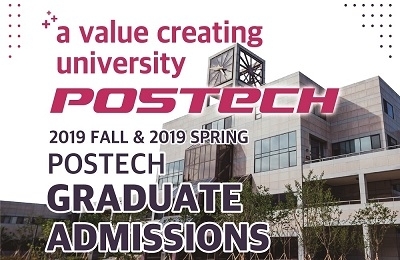 For any prospective applicants from POSTECH, we offer one-on-one counseling sessions with our professors from each field of GEM to provide detailed and customized information on admissions and academic opportunities available at GEM. Anyone interested is welcome to participate.1. Counse..
2015 POSLEC Summer Korean Class ◈ Registration Period : Mon, June 8, 2015 (10:00 am) – Fri, June 12, 2015 (6:00 pm) ◈ Payment period : Mon, June 8, 2015 (10:00 am) – Fri, June 12, 2015 (6:00 pm) Payment will not be accepted after this period. ◈ Duration of the session : Tue, June 23, 2015 – Thu, July 23, 2015 (for 5 weeks) ◈ Who are eligible to register? All POSTECH students (undergraduate/graduate), researchers, faculty, staff, and their familymembers (except elementary, middle and high school students), students who are on a leave of absence but are schedul..
Prevention and Control of MERS (Middle East Respiratory Syndrome) Since the diagnosis of Korea's first MERS patient, the number of MERS patients has increased rapidly, causing concern among POSTECH members. Accordingly, POSTECH Health Service Center hereby announces guidelines for preventing and controlling the spread of MERS. For those of you who have symptoms of the MERS virus, please immediately report it to either POSTECH Health Center or Pohang Namgu Health Center in order to prevent spread of the disease. Please carefully read the following information below: 1. MERS (Middle East Respi.. The 4rd POSTECH Cultural Content Contest in Science and Technology An opportunity to enhance creativity and imagination Chance to express ideas through various media 1. Theme/Topic- Science Fiction; free topic- Photo Story, UCC; Choose one of the following ‘POSTECH’, ‘Postechian’, ‘Science and Society’ 2. Categories and Rules- SF; About 110 pages of 200 characters squared manuscript paper- Photo Story; 5~10 pictures with appropriate captions that constitute a 'story' Any format available is allowed (ppt, pdf, photo cartoon, etc. )- UCC; Run time of 3 minut..